We are excited to announce an exclusive bounty rate increase of $10 (regularly $3) when your readers sign up for a Prime Student 6-month free trial. This promotional rate is only available during the month of May. 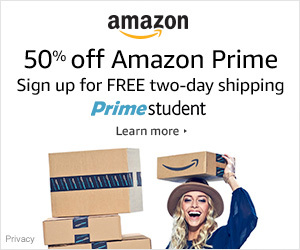 Prime Student membership includes free two-day shipping, exclusive discounts available only to students, and access to Prime Photos and Prime Video. For more information about this bounty rate increase or how the bounty program works, visit Associates Central. Be on the lookout for even more exciting offers from the Amazon Bounty Program. We are excited to announce an exclusive rate promotion for the Amazon Music Unlimited bounty that goes into effect on April 1, 2017. For this promotion, available only for the month of April, the rate will be increasing from the current $3 to $10 over a limited time. Associates earn the new bounty promotional rate when your visitors sign up for a 30-day free trial of Amazon Music Unlimited. Visit the Promotions Hub to get your link and banner to take advantage of this limited time rate increase! Be on the lookout for even more exciting offers from the Amazon Bounty Program. For information about the Amazon Bounty Program, learn more on Associates Central. The Amazon Associates Program is excited to offer a fixed 12%* rate on products sold through Recommendation and Search ads between April 1, 2017 to April 30, 2017. To make the most of this promotion, simply create a Recommendation or Search ad unit and place it on one, or all of your web pages. You will then automatically receive this special rate starting on April 1st for products sold through those ads. Click here to learn more about the promotion. We have also created a helpful guide for more information on how to easily integrate Native Shopping Ads on your website. *Terms and conditions apply, see the promotion page for more details. We are excited to announce an exclusive bounty rate promotion for Amazon Home Services that goes into effect on March 1, 2017. For this promotion, which is only available during the month of March, the rate will be increasing from the current $3 to $10. Associates earn the new promotional bounty rate when your visitors order their first home service through Amazon’s new Home Services marketplace. Visit the Promotions Hub to get your link and banner to take advantage of this limited time rate increase! Be on the lookout for even more exciting offers from the Amazon Bounty Program. For information about the Amazon Bounty Program, including a video overview of how it works, visit Associates Central. Now with over 250 brands to choose from, your users can simply press the Dash Button to order their favorites. You earn commissions on each Dash button sold plus, we are offering a $4.99 credit after the first press essentially making the button free for your users. Learn more. Now, Prime members can add an Anime Strike subscription to their membership. Best not-for-kids anime: classics, exclusives, and hard-to-find content (like new episodes from Japan’s famed late-night anime blocks). Features a curated collection of serious anime, like Blue Exorcist: Kyoto Saga, Paprika, Tokyo Godfathers, and much more. Learn more about Amazon Channels or get banners here. Amazon Associates Link Builder is the official free Amazon Associates Program plugin for WordPress. The plugin enables you to search for products in the Amazon catalog, access real-time price and availability information, and easily create links in your posts to products on Amazon.com. You can generate text links, create custom ad units, or take advantage of out-of-the-box widgets that we’ve designed and included with the plugin.